I collect and prepare fossil crabs from the Pacific Northwest. Some are given to museums and my small collection is available to researchers. I do not sell or do commercial work but have on occasion donated my time to prepare items from museum collections. My work can be viewed on Facebook. 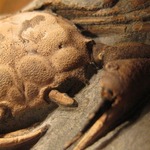 Hi Evin, I'm curious, is each crab fossil in a concretion? Are they eroded away so that you can see that they all contain crabs? I've come across similar concentrations of concretions in stream beds here in Oregon, (rarely), but most do not contain crabs, but other bits of organic materials, i.e. wood, shell.